RICHMOND — After spending the past decade tied to other decommissioned Navy vessels in Northern California’s Suisun Bay, the 887-foot USS Iowa took the first step in its final voyage to Los Angeles Harbor, where the 1943 battleship will be berthed in San Pedro as an interactive floating museum. 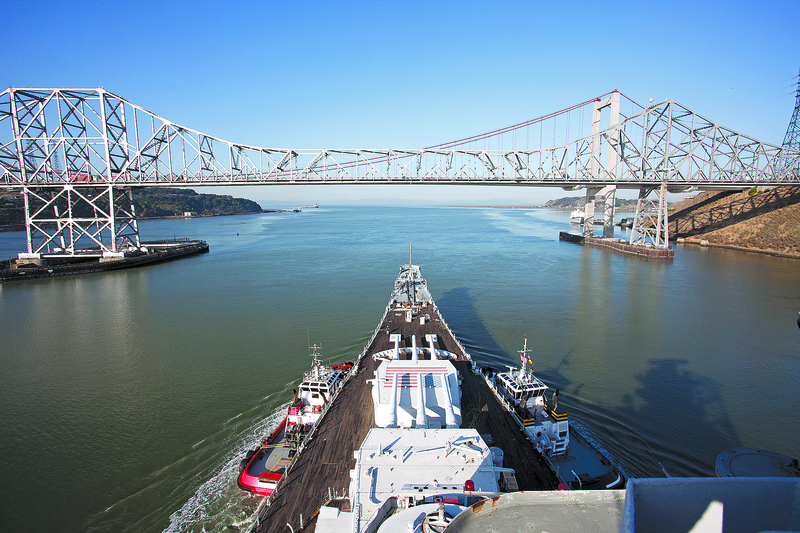 On Oct. 27, four tugboats helped tow the vessel more than 20 miles from the Suisun Reserve fleet to Richmond Terminal 24, crossing underneath three bridges along the way — one of which had not been built when the ship was mothballed nearly a decade ago. With just feet to spare from the base of the bridge, the vessel transit went off without a hitch, according to Jonathan Williams of Pacific Battleship Center — the Los Angeles-based nonprofit organization that the Navy awarded USS Iowa to in September, beating out a Vallejo-based group that was in the running for the ship, as well. Williams said the extreme high tide on Oct. 27 was needed to get the vessel’s more than 32-foot draft through the usual 25-foot average channel depth in the middle of Suisun Bay. “It was great timing, and all of the stars aligned,” Williams said. The towing process took two days, with Crowley Maritime conducting the towing operations. After passing under the Union Pacific Railroad Bridge the first day and traversing the shallow shoals of Suisun Bay, the 45,000-ton ship was towed to the Port of Benicia docks for the night. The following day, the ship traveled another 15 miles, going under two more bridges and concluding the voyage in Richmond. Here, the ship will undergo hull repainting. “Everything went extremely smoothly, despite having at times only inches between the ship and the bottom of the channel,” said Pacific Battleship spokesman David Oates. With more than 20 years since the ship was last in active service, many repairs and refurbishment tasks must be conducted before the ship can make the trek down the California coast to its new homeport. Oates expects the restoration process to last through the year, with hopes to move the ship south in February. Operating as President Franklin D. Roosevelt’s transport during World War II, the 1943-commissioned ship was originally deployed in the Atlantic and then moved to the Pacific fleet in Long Beach. The Navy installed a bathtub and elevator on the ship to accommodate President Roosevelt, who was in a wheelchair. USS Iowa was the only battleship to include a bathtub on board. So far, Pacific Battleship Center has raised approximately $5 million for the vessel to be turned into a museum, with an additional $3 million expected from the state of Iowa. According to Pacific Battleship Center president Robert Kent, USS Iowa is expected to bring in nearly $1 million per year in direct state/local sales tax revenues, as well as an estimated $240 million in direct and indirect economic impact over 10 years. The Port of Los Angeles Harbor Commission approved San Pedro Berth 87, along Los Angeles Harbor’s main channel, as the destined home for USS Iowa, where the ship is expected to attract more than 45,000 visitors annually. The new home will place the ship alongside the port’s existing cruise ship terminals and across from the museum ship SS Lane Victory. For more information, visit pacificbattleship.com.